Mothers knows tire and wheel care! The Mothers Tire & Wheel Brush Kit gives you two reasons to take better care of your tires and wheels: Mothers Contoured Tire Brush and Mothers Wheel Brush. Both brushes make wheel cleaning so easy and comfortable, you’ll look forward to it! Mothers ergonomic tire & wheel brushes are designed for maximum comfort and cleaning muscle. The rubberized handles make the brushes easy to grip and the chemical-resistance bristles are perfectly suited to clean their intended surface. The Wheel Brush’s bristles are soft so as not to scratch the wheel. The Tire Brush’s bristles are sturdy to effectively scrub rubber. A subtle curve gives Mothers Contoured Tire Brush a definite advantage over other tire brushes. The wide brush cleans most tires from wheel to tread. Clean tires faster and with less effort! The handle of the brush is parallel to the brush head to give you maximum leverage as you scrub dirty tires. The rubber, textured grip gives you a comfortable and firm hold on the brush, even with wet hands. The brush head is surrounded by rubber to buffer it if it should accidentally bump the wheel. The short, sturdy bristles are ideal for scrubbing tough rubber. The bristles are able to release dirt and oil from the rubber’s pores to leave the rubber clean and supple. The Tire Brush measures 7 x 5.5 inches. 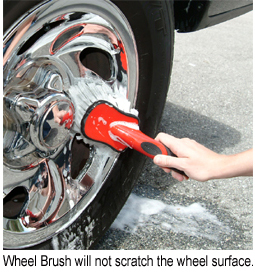 This ergonomic wheel brush makes cleaning your wheels more comfortable with a rubberized grip. There’s even a spot for your thumb so you can use extra pressure where needed. The handle is angled away from the brush head to keep your hands clean and dry, even if the wheel is not! The feathered bristles are sturdy enough to knock stubborn grime out of the way, yet they will not scratch the wheel surface. The bristles are chemical resistant and flexible. The Wheel Brush measures 10 x 4.5 inches. When you’re cleaning your wheels and tires, it’s just as important to use the right products. McKee's 37 Foaming Wheel Cleaner Gel is a water-based cleaner that works well on tires and wheels. It is noncorrosive and safe on all metals and clear coat wheels. Mothers Tire & Wheel Brush Kit will make tire and wheel care easier and more effective with ergonomic handles and surface-specific bristles. The Mothers Wheel Brush and Tire Brush are essential additions to your Mothers detailing arsenal. A total retail value of $12.98. Save $2.99! I tried this pair of brushes and am happy with the results. The longer brush is soft and perfect for wheels with no scratching. Just spray on your cleaner and scrub away. The contoured tire brush fit my tires perfectly and in combination with the tire cleaner I used worked very well. It is very stiff so be careful near your wheels. ProsThe right size and shape for the job.